Hello Darklings! 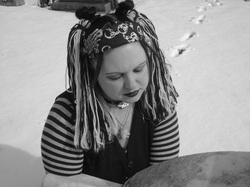 My name is Raven Morbidicity and I have always been in love with morbid things, just recently I have started to follow my passion and dream for alternative modeling. I find the goth world to be the most morbid and beautiful. I like to find the beauty in many things that others don't. Ever since i was young I have wanted to be a model or an artist. I have always enjoyed things that were dark and morbid because I was told they were forbidden. I went to private school that was VERY strict on what was okay to like and what wasnt. Skulls were bad, people who performed non Christian music was bad and everything outside what the Bible preached was satanic. As a normal child I enjoyed pushing my limits. In junior high, I began to read books on witches and witch craft and vampires. I began to discover my love for things paranormal and when I got into high school and went to a public school, I thought the goth people were BEAUTIFUL and I wanted to be beautiful like them. Of course I feared the stuff at first because its natural to fear the unknown. I began to realize that I was more comfortable being dark and gothic, and sadly I got relentless teasing for it. As I got older I tried to be what everyone else wanted me to be, but a person can only PRETEND for so long. I returned to myself, because someone told me "You are your own best friend" and deceiving myself was hurting me. Now i am determined to follow through with my dreams with my head held high.